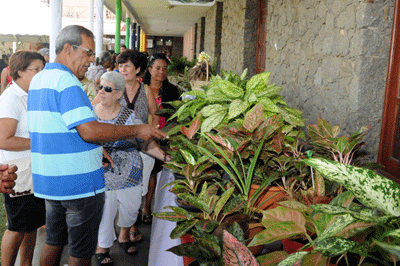 Tomorrow the Small Enterprise Promotion Agency (Senpa) celebrates its 12 years of existence and to mark this milestone a flower show, among other activities, has been organised. The show was officially opened yesterday morning on the grounds of Camion Hall, Senpa’s headquarters, in Victoria in the presence of the Minister for Investment, Entrepreneurship Development & Business Innovation Michael Benstrong, the chief executive (CEO) of Senpa Penny Belmont, local vendors and other guests. 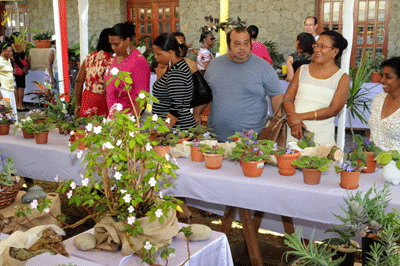 Since its setting up on August 2, 2004, the vision of Senpa has been to ensure that small enterprises in Seychelles become the primary contributors towards the growth of the country’s economy as a whole by producing a high standard of quality products and services that are fully competitive both locally and internationally. Minister Benstrong pointed out that Senpa’s main goal is to promote local vendors and help in the development of the country’s economy. He noted that the number of businesses registered with Senpa since its launch in 2004 has increased from only 220 back then to 2841 currently. Senpa’s objectives are to promote small enterprises and development of crafts and cottage industries in collaboration with the ministry, to identify obstacles to the sustainable development of small enterprise, crafts and cottage industries, along with other key responsibilities. 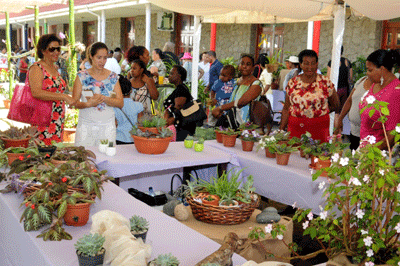 Ms Belmont noted that Senpa has been present for 12 years and still promoting local craft made in Seychelles. “I have been working with Senpa for the past three years, and Senpa is still working to promote small businesses. We are here to support and give advice to all people wanting to venture in a small business,” she said. During the ceremony seven employees who have been with Senpa since the beginning were rewarded by Ms Belmont. They are Micheline Joubert, Cecile Hoareau, Sabrina Quatre, Noella Rachel, Jacqueline Mirabeau, Nella Rose and Evaline Joubert. Ms Belmont and Minister Benstrong then proceeded to cut a cake to mark the occasion. The accompanying photographs show guests admiring an assortment of flowers in the show after the official opening ceremony.